In responding to Suzie’s post defending wildlife rehabilitation I began to think again about the areas in which animal rights and animal welfare overlap with the field of conservation, and the ways in which they don’t. It’s a subject I’ve thought a lot about over the years, pretty much since I first started studying biology at undergraduate level. People would often express surprise that I, someone that cared about wildlife conservation, would eat meat. Not from an environmental perspective but from a “don’t you like animals?” one. It’s an understandable confusion in a way, as both conservation of animals and looking out for the welfare of animals are fairly natural impulses for the people that care about animals. If you like animals you will generally not want them to suffer and you won’t want them to go extinct. And people that work in either conservation or animal welfare tend to like animals. But it is important to remember that animal rights and wildlife conservation are two separate concepts (and arguably animal rights is a different concept to animal welfare, but for the sake of this discussion I’m going to treat them as more closely related ideas than they perhaps are). Animal rights is concerned with preventing the suffering or even use of animals by humans. Wildlife conservation is concerned with protecting wildlife at the level of species or perhaps population. With the exception of species that number in the hundreds, conservation biologists are not as concerned with the fates of individual animals, it is only when such fates of many individuals are added up do they begin to worry. Before people start thinking biologists are somehow cruel in this regard, I should note that they are worried about species as a conservationist. Many will still worry about the fate of individuals as ordinary people. It’s only natural. But it actually is not a bad thing to take the more dispassionate and unsentimental route, because they are in the field of nature and nature is astonishingly dispassionate and unsentimental. By way of an example take the Western Gulls that I studied on the Farallon Islands in California. Each year tens of thousands of these gulls go to the islands and each pair will lay three eggs. Most of these clutches of eggs will hatch to produce three fluffy and adorable chicks. And most of these chicks, on average two point five per clutch of three, will die before they can fledge. Either beaten to death by another gull or starved to death, life is very short and very cruel for most of this new life. And as a biologist you really have two choices, shrug it off, or let it break you. You cannot care about the individual, not at that level of suffering. Not when every day you’re daily stepping over bloody and beaten chicks in their last desperately awful hours of life. But you can take solace in the results at the end of the breeding year, when loafing around the intertidal are a shiny new cohort of finely plumage grey youngsters, all ready to carry on Western Gull line into the future. Western Gull chick. If you are easily upset it is best not to dwell on its likely fate. (Image by unknown PRBO intern). This is not to say biologists are indifferent to suffering animals. 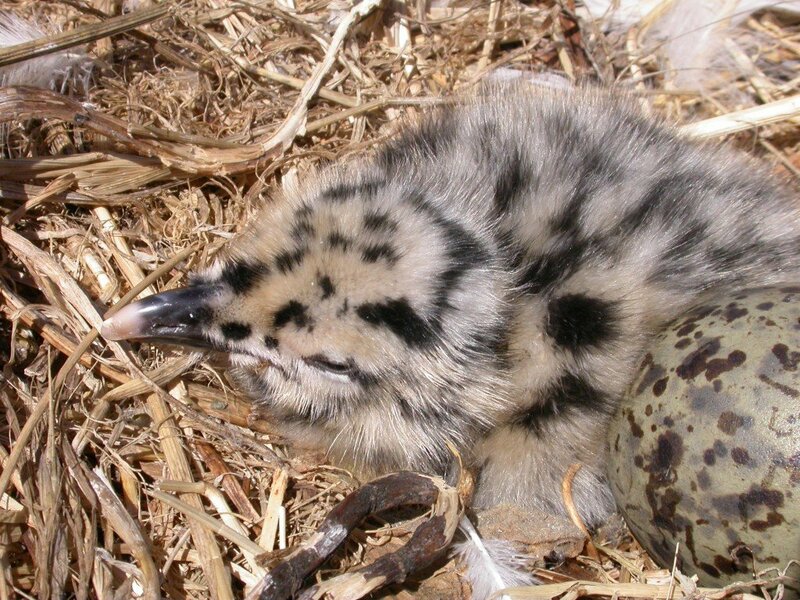 More than once on the island I would snap, throw a stone or otherwise scare away a marauding adult gull, and scoop up a chick it was beating to shove somewhere safer, like under a bush. But it does mean that biologists tend to take a realistic view on suffering than the public at large. It’s a fact of life, indeed high infant mortality is pretty much the rule for all life. It’s the crucible that drives evolution, if you’ll forgive me for mixing metaphors. Life is nasty, brutish and short. But life endures. I’m sure you can see where this is going. Where one view tends to favour the bigger picture and one is concerned with each individual, or the rights of the individual, there will naturally be some divergence in priorities, and in what are considered optimal results. Worse still, there will be situations where the two forces come into direct opposition, where the goals of animal rights clash outright with those of wildlife conservation. One of the first examples I ever encountered was in the books of Gerald Durrell, the famous conservationist who was an early pioneer of the roles of zoos in conservation. He often defended that role in his books from animal rights activists who opposed “imprisoning” animals in zoos even if it saved them from extinction. It’s a fairly fringe position even among animal rights and welfare people, but it is an example of how the two movements don’t always agree. A more problematic conflict is that fought over what to do with damaging introduced species. This is a very serious business here in New Zealand. New Zealand has been the recipient of a higher than average number of introduced species, in particular a range of mammals from elk to mice. This is quite a big deal for an island group that had no mammals save bats for millions of years. I’ve written at length about the specific vulnerability of insular faunas and the catastrophic extinctions caused by the arrival of rats, mice, ferrets, cats and possums (amongst others), here in New Zealand fully half the pre-human bird species were lost. The essential point is that the ecosystems of New Zealand were unable to cope with mammals, the organisms lacked the ability to defend themselves from the very different problems posed by mammal predation. The initial solution in New Zealand was to move species to islands where mammals hadn’t reached. This technique achieved a temporary respite for some critically endangered species, but there is a real shortage of islands around New Zealand with no mammals whatsoever. So New Zealand began the process of clearing islands of mammals, using poison, trapping and shooting. Starting with smaller islands but moving onto bigger islands, the programme has ben a resounding success in creating places for the more vulnerable species to survive. On the mainland, however, the declines of species have continued, with species that were common on the mainland thirty years ago now almost lost. In some areas, particularly national parks, the regime of poisoning and trapping has been expanded to the mainland. In these areas there are no natural barriers to prevent re-invasion and so the poisoning and trapping are not one off treatments but require ongoing applications. In humans, the symptoms of poisoning normally appear between 30 minutes and three hours after exposure. Initial symptoms typically include nausea, vomiting and abdominal pain; sweating, confusion and agitation follow. In significant poisoning, cardiac abnormalities including tachycardia or bradycardia, hypotension and ECG changes develop. Neurological effects include muscle twitching and seizures; consciousness becomes progressively impaired after a few hours leading to coma. Death is normally due to ventricular arrhythmias, progressive hypotension unresponsive to treatment, and secondary lung infections. Symptoms in domestic animals vary: dogs tend to show nervous system signs such as convulsions and uncontrollable running, whilst large herbivores such as cattle and sheep more predominantly show cardiac signs. It is without question an unpleasant way to die for any animal. But the poison is still pretty much the best solution New Zealand has to dealing with introduced pests. It is biodegradable, meaning that it doesn’t build up in the wild (like say DDT), and without it a government report concluded that many species, including the iconic kiwi, would be extinct in New Zealand within a generation. Unsurprisingly while the use of 1080 is strongly supported by the conservation movement here, it does face opposition from animal rights groups which consider the cruelty of the deaths to not be worth the benefits, and instead advocate using other methods, such as fertility control. How fertility control might be applied to millions of possums, especially in the face of evidence that trap neuter and release campaigns for cats achieve nothing useful in denting the numbers of cats, is not answered by these groups in any way I can see. In New Zealand at least public opinion is generally behind 1080. The nation is generally very aware of the unique and imperiled status of the wildlife here, and is proud of the work to save species like the Kokako, Takahe and kiwi. The conservation movement also has an ally in this in the farming industry, which relies on possum poisoning to reduce the potential reservoir of bovine TB (if that seems like an interesting alliance, in this fight the animals rights movement is allied to hunters, which oppose the control of larger introduced species which they like to hunt!). In addition the use of 1080 has the support of most of the major parties, from the very conservative ACT Party to the liberal Green Party, and perhaps more importantly the dominant National and Labour parties. Nobody that supports the use of 1080 is blind to its faults or thinks it is the ideal situation, it’s a desperate response to desperate situation. But opposition to its use can be understood if you oppose cruelty. There are, however, situations where opposition to conservation efforts make less sense. Take a project to remove rats from the Californian island of Anacapa (in the Channel Islands). The island was home to an important population of Xantus’ Murrelet, but the population was suffering as a result of introduced rats. It’s actually a problem for many seabird species these days, since seabirds have long chosen to breed away from mammals in dense colonies, and mammals have been good at reaching these islands in the era of man. From a conservation perspective the poisoning of rats was a no-brainer, a single application of poison over a relatively small area would protect the future of a species. But animal rights groups (albeit not all of them) not only opposed the move, but sued to prevent the poisoning. Two activists where even caught spreading antidote to the poison on the island! The efforts of the animal rights groups failed, and thanks to the rat free status of Anacapa numbers of the endangered Xantus’ Murrelet were up 80% in three years. But time and again around the world efforts to protect endangered species are opposed by animal rights groups if the problem requires some control of introduced species. Gerald Durrell relates one story in trying to save the endemic herpetofauna of Round Island in Mauritius. The island was being ravaged by rabbits that were destroying every last tree, threatening the future of three lizards and two snakes. Animal rights groups sued to prevent poison being used to kill the rabbits, and even told a mediator that they would rather every reptile on the island die than a single rabbit be killed. Eventually the courts ruled in favour of the conservationists, but the animal rights group at least got one of their wishes, the efforts were too late to save the Round Island burrowing boa. It should be noted that what many of these people objecting to the control of introduced species are upset about is not cruelty so much, it is the fact that we are violating the “right” of the introduced species to live. But from the perspective of conservationists allowing introduced species to endure is to essentially sign the death warrant to dozens if not hundreds of species, something anti-ethical to what conservation tries to do. Not all those concerned with animal rights and welfare are so extreme in their positions, but there is always a tension between the conservation and animal rights, perhaps an unavoidable one. That tension can exist not only as a conflict between different organisations, but also as an internal conflict in the mind of someone that cares about wildlife. The tension may be unavoidable, but it is worth being aware of. Duncan, thank you for writing this important blog post. As a birder, I can get upset when a Blue Jay plucks a nestling House Sparrow from a nest. However, I am a realist, too (and consider myself to be a conservationist). I know that in nature, “it’s a war out there” everyday. Nobody has to like the use of 1080 to protect New Zealand’s birds, but we had better accept such action if we truly want to conserve species that are rapidly declining. Thanks again for your post. Brilliantly said, Duncan. I despise the use of 1080 and it pains me to see it done, but I’d be the first to vote for it and volunteer to apply it. The alternative pains me even more and deeper to my core. I don’t know whether the paradox of a conservationist being simultaneously scientifically dispassionate and life-consumingly passionate about the same subject is a learned or inborn trait. I do know that it is very difficult to articulate. Duncan, this is a wonderfully thought out and well written article. Nature, left to it’s own devices, is very definitely red in tooth and claw. And I would much rather lose a few thousand rabbits than an entire bird species. Your article should be mandatory reading in some circles. Great post. We screw things up and now we are forced to take conflicting remedies to try to save what is left. I am afraid that this will only get worse as we continue to damage the balance in Nature. I love that there are animal welfare advocates, but when it takes that extra step up to “activist,” then I tend to not understand their rationale or motivations any longer. They lose me, and I am afraid they lose the sympathy of far too many others as well. They make for a good story in the news, though, so even a lunatic fringe can end up with too much airtime, where they often put a negative face on the issues hurting public opinion and, worse, policy-makers opinions of real conservation efforts. I have a little catch-phrase I always tell people: use a brain and not a bleeding heart. Balance is the objective and sometimes a big heart is the difference to success. Where the bleeding heart/ big heart line is drawn – I don’t know. A few more questions. How do folks feel about Ornithologists continuing to collect specimens in remote areas. Ironically, these areas are some of the only remaining wild areas and then some collecting crew is given a permit and heads in for a month of shooting birds…. How do we get folks to understand the importance of preventing invasive species including plantlife. eg Spotted Knapweed, Kudzu and Water hyacinth just to name a very few. I watched huge groups of Asian Carp in a Montana lake recently while people asked why duck numbers were down. The formerly 100 % clear water was now murky and the underwater vegetation which Canvasback to Tundra Swans depend on, is being consumed by invasive fish. Complexity, improving our behavior, and cleaning up our mess is the new order of conservation. This has not always seemed to be palatable to many as if it verges on something birders shouldn’t have to deal with…. I will look forward to your thoughts in response. Good analysis of the ‘clash’ – something I’ve had to experience myself as a professional conservationist e.g. with organisations like SPCA. The problem is that animal rights activists don’t seem to understand that death is also a part of life, and that in order to maintain the balance, some animals have to die in order for others to live. Thank you, Duncan, for an insightful post with outstanding examples and personal experiences. Greatly appreciated! Timothy – I can take a stab at answering the question about collecting bird skins – personally I am not opposed to it, within reason. Museum skin collections are important resources for scientists, and are far more useful when collected in a systematic way. Much of the existing collections were obtained during the Victorian era and were rather haphazard in their selection and often had terrible notes (I’ve found specimens of parrots labeled as having come from tiny treeless rocks where no parrot could possibly exist). So long as the species is not harmed (no need to collect any Californian Condors!) I think the practice is defensible, but I acknowledge I may be in a minority here.. When recounting your studies of Western Gulls, you said, “You cannot care about the individual, not at that level of suffering.” I could never do what you do, which makes me grateful that there are biologists like you who can study birds in their natural habitat, witness exactly what goes on, and admit that it affects you – but then, not only do you continue your work and celebrate the ones who make it, you write about it so well that you can bring people into the birds’ world. But then there is Dyan deNapoli, who witnessed the mass suffering of South African penguins in the Treasure oil spill, and helped 40,000 of them. The difference, of course, is that the oil spill was human-caused, while gull predation is a natural occurrence. The similarity is that in the end, you were both working for conservation. It’s too easy for rehabbers to get tarred with the same brush as the nut jobs you described, who would rather watch an entire species of snake become extinct then to hurt a single bunny. The extremists get the press! I doubt if there is a more passionate and vocal opponent of outdoor cats and feral cat colonies than the rehabber who has received too many shredded songbirds to count. There is a subspecies of biologist that we consider destructive nut jobs – some of the bureaucrats in US State Depts of Environmental Conservation/Protection. Remember last December, when the grebes crashed in southern Utah? Over 3500 went down, over 1500 injured. The public wanted to help, rehabbers were ready and willing, and the bureaucrats – I’m not sure some of them even had a biology degree, but all of them talked about “conservation” – wouldn’t hear of it. Most of it would have been triage and euthanizing the badly injured, but the “conservationist” approach was throwing them all into unfrozen lakes. People like that give biologists/conservationists a bad name. People defending the rights of introduced rats over native species give animal lovers a bad name, too. Thanks for the comments Suzie. It was a tricky article to write, and I wonder if I didn’t do a good enough job of distinguishing between animal rights and animal welfare. I personally am not really a supporter of animal rights, but strongly support animal welfare laws to protect animals from criminal harm and neglect. It is also hard to avoid tarring everyone with the same brush. I’ve met many people who support animal rights and oppose controlling introduced species who simply don’t understand the issues involved. It isn’t malice that motivates them (unlike those genuine extremists), and if you explain the issues carefully they may change their minds or at least concede the opposition has a point. I think that is the crucial issue. Neither side are demons, it is a genuinely difficult problem and how you think it should be resolved varies depending on which view you take, big picture or narrow. Understanding that is crucial to developing both a starting place for dialogue and also for deciding how to understand one’s own conflicted views on the subject. I agree with you on your conclusions about animal rights and animal welfare. It is a tricky balance. I am not a vegetarian but find myself appalled at the food pipeline in the US. As a birder, ornithologist and wildlife film-maker, I am quietly sitting with the collecting issues. Later today, I will be visiting a museum to view skins of Bewick’s wrens. I feel a strange guilt about even this. No, Duncan, I think you did a really good job of distinguishing between animal rights and animal welfare. The animal rights people you mentioned are idiots, as they’re fighting for the rights of one plentiful species over an endangered one. Sometimes they fight for a way of life they deem acceptable but is not possible. Animal rights activists have snuck into rehab centers at night and “freed” education birds, who are unable to fly or are half blind and have no chance of life in the wild. Some believe you should not own an animal – so where do all the pets go? I can rail against people like this, yet I fully support the animal rights activists who took secret videotapes of companies that test cosmetics on animals’ eyes, and now the Draize test is rarely used. There is no downside for stopping the torture of animals for something as stupid as cosmetics. And who wouldn’t want to throw a dead raccoon on Anna Wintour’s lunch plate and shout “Fur is Dead!”? Normally I don’t consider myself an animal rights person, but sometimes I do, though I’d wipe out a feral cat colony myself and lose no sleep over it. I consider myself a conservationist, yet have to admit I loved ELF ( I’ve always wanted to blow up a Hummer dealership.) You are so right about sorting through your own sometimes conflicting views! Suzie’s comments stirred up another thought which is also closely related to this subject. The incredible amount and sheer numbers of wildlife killed by cars and trucks. This slaughter is simply appalling. Everyone acts as though it is unavoidable. So often this is just not the case. The need for underpasses and over-passes for wildlife is also a pressing need. In many cases in the west interstates are being fenced with structures so tall that fence does not correctly describe the structure. This often extends for miles also. In certain areas, and especially in the case of Pronghorn, we may be developing areas where populations will no longer be able to maintain contact- let alone exchange genes. All in the name of interstate Highways and the glory of being able to drive a gasoline engine powered vehicle at any speed without interuption or even paying attention. The numbers of Box Turtles, Raccoons, Skunks, Coyotes and of course White-tailed Deer killed this spring along highways were staggering. if one travels in your profession, then you are able to witness what I am speaking of. So Duncan, here is another area where animals pretty much minding their own business are quite wastefully and somewhat cruelly are slaughtered. How do you see this fitting into the equation of Animal Welfare and Animal Rights? Tim – Honestly? Roads are no different to any other economic activity that has deleterious effects on wildlife. Development, agriculture, mining, fishing, all these activities will cause the deaths of lots of individual animals. The thing with roads is that you see the animals die, something you generally don’t when a forest gets developed into a farm, office or mine. And with all the will in the world we aren’t going to stop 7 billion people pursuing their economic betterment. You need to focus on mediation, and in particular focusing on species which are in danger. At least that is my perspective. And if you really want to feel guilty visit the skin collection of the Te Papa (National Museum of New Zealand). Rock Wrens, New Zealand Bitterns, Auckland Mergansers, Huia, Laughing Owls, South Island Kokako. Hell, my own research involved Chatham Bellbirds, Chatham Fernbirds and South Island Snipe. I agree with all of the comments here, suggesting these issues are complex and nuanced. I consider myself a conservationist but, like Suzie, embrace some (if not many) tenets of animal rights philosophy. I photograph wildlife and was trained as a rehabber, so I understand the truth of the wild, as it were — both the macro and micro of this existence and the hardship and suffering inherent in survival and death. But, as an individual human, I feel beholden to the fact that I have the capacity (or imperative?) of moral choice, which a Western Gull may or may not have. That’s where my philosophy most intersects with the long history of animal rights thinkers and their literature. And that’s why in my efforts with animals, I do my best to interceded when I encounter human-inflicted injury. It is, indeed, a precarious endeavor to paint any group with a broad brush. Duncan, you make excellent points and it’s a piece I will ruminate on for some time. Putting aside misguided (if well-meaning) extremist points of view, one must also recall that some advances in human rights had their genesis in the animal welfare and animal rights movements … such as the ASPCA’s endeavors to protect children in factories in the 19th century. From my perspective, there is significant crossover in all disciplines and philosophies which makes this discussion, like the most important ones in life, impossible to reconcile with any simple distinctions. I think to truly coexist on this planet means to understand the tenuous web that connects us all — and which is huge gray area of thought, belief, and behavior. I don’t believe we can separate ourselves the fate of other animals, either collectively or individually. Collectively, our efforts to remedy what our presence and other intrusions have wrought on animal populations, serves a long and short-term planetary benefit. Individually, what we do to help the injured or helpless among us, serves to enhance our humanity and our overall compassion for existence itself. Great post duncan. I will be sharing with my animal rights activist friends and community. Yes, very well-written. I had not heard about the Anacapa activists, that is hilarious/insane/almost sad. Anacapa is just a short boat ride from where I grew up. I don’t have much to add that isn’t in the post I…er, Felonious just wrote, we are in agreement. Weighing in on the Anacapa issue, being from California, I recall significant objection from viable wildlife organizations precisely because of the poison’s potential effects up the food chain. It wasn’t just animal “rights” organizations that questioned the efficacy-versus-effects aspect of this proposed plan. Almost all wildlife hospitals deal with secondary poisonings in raptors and higher predators, and from my perspective, this was a valid reason for some of the official doubts that arose about the anti-coagulatory poison program. Everyone involved in wildlife issues understands there are significant trade-offs when it comes these problems. But, regardless of what course is ultimately followed, and which trade-offs are ultimately accepted, I think it’s prudent to voice concern when poisons and rodenticides are used in any ecosystem. It’s a complex conundrum. I and the Bird: What is a Vulture?